Home » Our Doctors » Emily Rausch O.D. Dr. Emily completed her undergraduate degree at The Ohio State University and recently graduated with her Doctor of Optometry degree from The Ohio State University College of Optometry in May 2018. She has an interest in pediatrics, binocular vision and vision therapy. 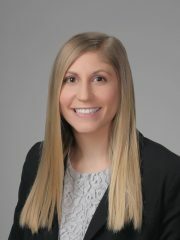 Dr. Emily is “homegrown”, she grew up in Marysville and graduated from Marysville High School in 2010. She initially joined our practice in 2009 as an exam technician. In her free time, she enjoys CrossFit and playing with her dog Duncan. She is excited to start her career back at the place where her passion for optometry began.